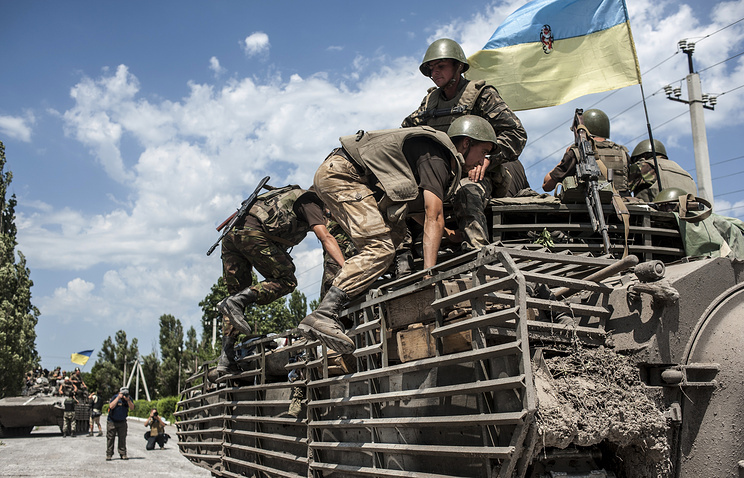 The Ukrainian Armed Forces’ withdrawal from Alexandrovka and their gradual retreat from Schastye are not connected to self-defense fighters’ actions, the press office said. “They are withdrawing on their own,” the press office said. The Ukrainian armed forces conducting a military operation in the country’s embattled southeast have suspended combat aviation flights in the area to investigate a recent crash of a military plane, the operation’s press center said on Tuesday. “Aviation flights have been suspended until a special order due to the investigation of Ukrainian Armed Forces' An-26 military transport plane crash in the Luhansk Region on July 14, 2014,” the press center said on its Facebook page. Ukrainian military aircraft involved in the operation have been at their permanent bases since July 14, the statement said. These measures have been taken to establish the causes of the An-26 plane crash and carry out an operation to find the plane’s six crew members, the statement said.